Vernon, U. (2010). Dragonbreath: curse of the were-wiener. New York, NY: Dial Books. 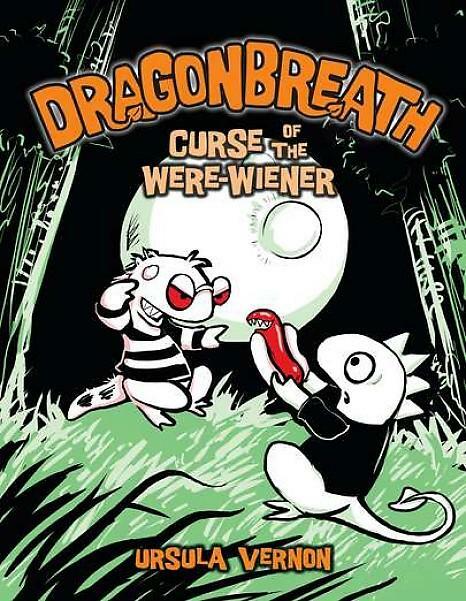 Dragonbreath: Curse of the Were-Wiener is a wacky new take on werewolves, a hilarious mystery adventure, a tale of a heroic journey, bravery, the length one will go for friendship in this highly imaginative and amusing tale. The readers get some fun nerdish insight about the daily life of Wendell, observe Danny breath fire, learn that libraries can actually be useless, and the true dangers of eating school cafeteria food. Danny Dragonbreath and his friend Wendell the Iguana try to stop the school from being further infected after Wendell is bit by an odd looking hot dog (product of Transylvania) and starts turning into a were-wiener. Their journey begins with discovering the were-winers in the cafeteria freezer with a feral hot dog label and a hotline number to call in case of emergency (1-800-WURST-RUS). They learn that to stop the were-wiener school conversion, especially the school bully, they must kill the alpha wurst which will also save Wendell from lycanthropy. Danny choses to enlist the Potato Salad, the ancient enemy of the Hot Dog, and with his gear ready (silver skewers and holy water with mustard), he and the potato salad fight off the minion hot dogs and Danny discovers that his when best friend is running out of time before changing into a were-beast and everyone is itching terribly like they have lizard pox, he finally breaths fire when it’s needed most, kills the Alpha Wurst and saves his friend and everyone else from their school. Danny has a fantasy prone personality, cheerful, superstitious, very energetic, and imaginative opposed to his best friend Wendell that is skeptical, factual, practical, orderly, and logical. Dragonbreath: Curse of the Were-Wiener is a nice change of pace in which these two friends actually reverse their typical roles in the Dragonbreath series. The story has some challenging vocabulary such as premonition, cannibalism, incinerated, morphing, diabolical, Carpathians, dubious, as well as several nonsensical words which also includes sound effects. This hybrid chapter book/graphic novel format does not disappoint. Danny and Wendell are amusing and likable characters and this third installment in the Dragonbreath series is very engaging. Readers will be eager to read more about these two friends and their bizarre adventures especially if they enjoy the Lunch Lady series by Jarrett J. Krosoczka, Giants Beware! By Jorge Aquirre, Lio: There’s a Monster in My Socks by Mark Tatulli, or even Zita the Spacegirl: Book One, Far From Home by Ben Hatake.